Razer™, a world leader in connected devices and software for gamers, today launched Razer Cortex, its newest software. 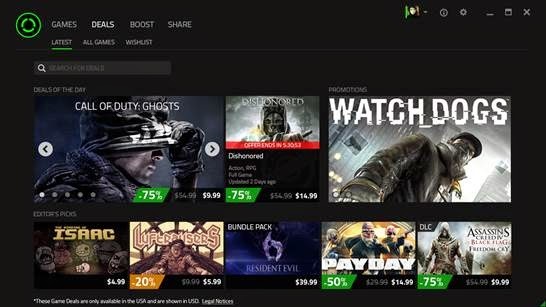 The program includes a price comparison engine, Razer Cortex: Deals, that provides Razer’s millions of users with access to exclusive game discounts. GOG.com, a leading digital game distributor, is the first to partner with Razer Cortex: Deals, and is offering eight games at 80 percent off normal retail price for one month beginning today. Razer Cortex is a performance enhancing game launcher that acts as the nerve center of a player’s entire gaming experience. With Razer Cortex, users can easily discover new games at their lowest prices, boost the gaming performance of their PCs, back up saved games to the cloud and record in-game footage. The public release of Razer Cortex follows a two-week, early access event where over 50,000 users tried out the software. More exclusive offers will be made available to Razer Cortex: Deals. For more information on upcoming promotions and to find the lowest prices on digitally downloaded games, download Razer Cortex at http://www.razerzone.com/cortex/. Boost – Enhance your PC’s gaming performance with the popular boosting utilities from Razer Game Booster incorporated into Razer Cortex. Share – Immortalize your gaming moments in video and screenshots with the touch of a hotkey. For a complete list of Razer’s gaming software that millions of gamers use every day, go to http://www.razerzone.com/software.